‘NDTV Frauds’ exposes the collusion among politicians, media and the bureaucracy. It walks us through the history of NDTV from its start to the current day. We see the unbelievable corruption that is NDTV, in this journey. ‘NDTV Frauds’ is not afraid to name names. It calls out Barkha Dutt, Bhaskar Ghose, Arun Jaitley and other leaders in the Congress and BJP. The main protagonists are Prannoy Roy and his wife Radhika Roy. There is a clean presentation of hypotheses, conjectures, facts and figures along with annexures and links. I liked the in-depth analysis and description of the perpetration of the frauds. The timeline of NDTV’s frauds in the book adds to its readability. The last chapter tells us what Barkha Dutt, Prannoy Roy and others are doing to escape prosecution. I liked the non-partisan cross-cutting apportion of blame. The wheeling and dealings in this book leave you feeling unclean. And it reinforces what we know about the political setup, media collusions and bureaucratic abuses of power in India. The riff-raff overshadow the decent people in these professions. This is a book which favours Subramanian Swamy. This is not a bad thing. We need an activist like him to bring things to light in our Indian context. I recommend reading this book, regardless of your political affiliation (or lack thereof). At its core, this unholy nexus is a cause of concern for us. We need to encourage investigative activism to expose more of this corruption. 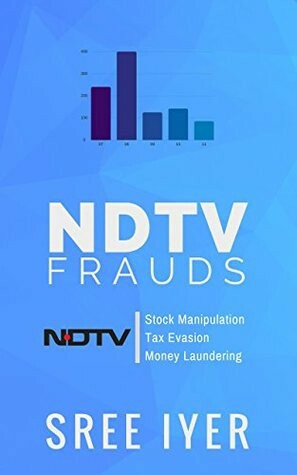 ‘NDTV Frauds’ is a short book, at about 50 pages.